A source is wherever you get your information. It can can be online or offline. It could be a certificate or a tombstone. It could be the conversation you had with your Aunt Betty. It could be a database. 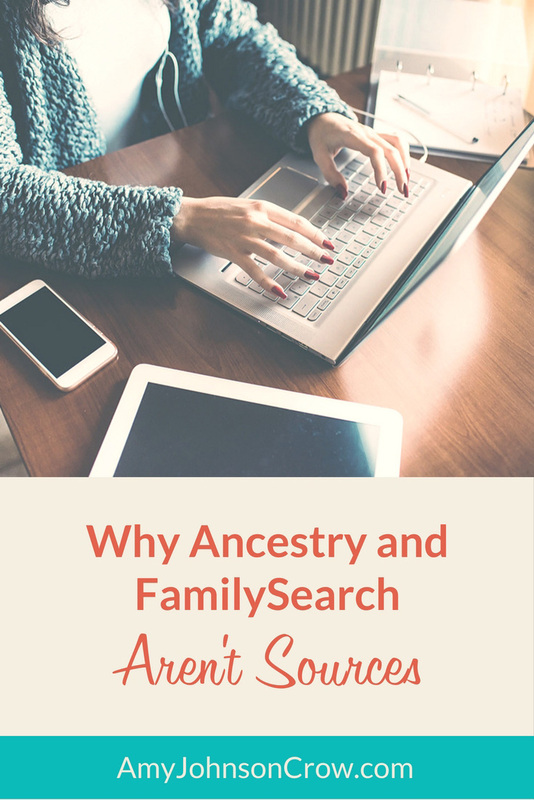 What a source isn't is Ancestry, FamilySearch, etc. So, if we're supposed to cite what we see and what we've actually used, why isn't Ancestry or FamilySearch a source? It's because they're made up of a bunch of different sources. A book is a single item. It has a beginning and an end. If you add more pages, you no longer have the same book. (Maybe a revised edition.) But when you say you used — when you cite — that book, it is known that what you used is somewhere between the front cover and back cover of that item. A website isn't like that. Websites by their nature can (and do) change. They are also made up of lots of different parts. You can add to a website and it's still that website. Making a website analogous to a library or a bookcase helps us be more specific when we're creating source citations. When you were in school, could you have used "Found at the Washington High School Library" as a source for a term paper? Probably not. But that's essentially what we're doing when we say "Found it on Ancestry" or "Found it on FamilySearch." Two reasons that we use source citations are 1) to be able to tell where a piece of information came from and 2) to aid in evaluating our conclusions. Ancestry, FamilySearch, and any other website you use have different parts to them. If we say only that we "found it on Ancestry," we don't have enough detail to tell which part of Ancestry we found that information. If I used Ancestry to find my great-uncle Harold's birth date, there's a big difference in having found it in someone's family tree or in the database of Ohio birth records that they have from the Ohio Department of Health. Similarly, if I used FamilySearch to find the death date of my great-great-grandmother, there's a huge difference in finding it in "Ohio Deaths, 1908-1953" (which has digital images of the death certificate) than in "Ohio Deaths and Burials, 1854-1997," which is a compilation of data from a bunch of sources (none of which are identified in this database). 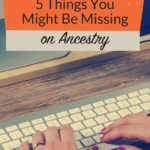 It isn't just with mega sites like Ancestry, FamilySearch, FindMyPast, and MyHeritage that we need to be more specific about. Any reference to a website should be more specific. If you were using the free databases on the Genealogy Center's website, did you use "Fort Wayne Catholic Cemetery Through 1993" or did you use "Lloyd Bros. Walker Company Monument Records, Toledo, Ohio"? If you found something on the Gallatin County (Montana) Genealogical Society's website, did you find it in the obituaries collection or the vital records index? I'm not one for spending tons of time deciding if part of a citation should be in quotes or italicized. I concentrate on getting all of the elements of a citation that I need; I can always reformat it later. To be meaningful, a source citation needs to tell us what we used. That means we need to include both the part of the website we used (such as the name of the specific database or article) and the name and URL of the website. When we get into the habit of considering a specific database or article on a website as the source, it puts us in a better frame of mind to evaluate what we're looking at. By thinking of "I found this information in this specific database," it puts us in a better position to evaluate what we have. "I found it on Ancestry" or "I found it on FamilySearch" is handy shorthand when we're talking, but it doesn't work as a source. This entry was posted in websites and tagged Ancestry, FamilySearch, source citations, sources by Amy Johnson Crow. Bookmark the permalink. Thank you. This post went a long way in clarifying some of the finer points of sources and citations that have been stumbling blocks for me. I’m glad it helped you, Gayle! So, if we state the 1900 Marriage record for _______ and _______, found in Cuyahoga County, Ohio. And there is a particular website that we got that information from, [http://probate.cuyahogacounty.us/pa/CaseSummary.aspx?q=MTQ1OTcyMA==], that is a credible source? It depends on what you mean by “credible source.” If you mean is the marriage record from the Probate Court a good record to have, yes. If you mean is that citation credible/accurate, it depends. I looked at the database you were referencing. Unless the database gives you an image of the actual record, I wouldn’t cite it as “1900 marriage record for ___ and ___” followed by the website. You didn’t actually see the marriage record. If it’s like the other entries I saw in that database, it was an index/abstract of the marriage. I would cite the database directly. Something like: “Probate Court of Cuyahoga County, Ohio Case Summary,” ; citing John Smith and Lizzie Albrecht marriage record, book 15, page 148. That way it’s crystal clear that you didn’t actually see the marriage record. Thanks! That answer really helped clear the “fog” about how to cite some of our findings (and about what others are actually citing). In many instances we see the reference to “Ancestry Family Trees” as the source. Can we actually use this reference as a source for our findings? To me it’s too wide broad to be use as a source. What are your views on this? That’s a good question, Robert. Ideally, you would cite to the specific tree you were using. 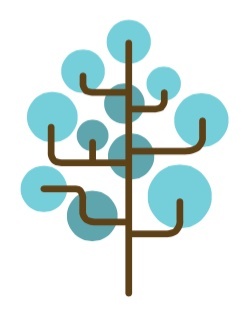 That isn’t always the easiest thing to record, so “Ancestry Family Trees” is better than nothing, and it’s better than just saying “Ancestry.” At the very least, it says that you are relying upon someone else’s tree for the information, which will be a flag later that you should follow up and do more research. Personally I try not to put down Ancestry Family Tree as a reference. I will check out the information and source if provided. I will follow up on the source and it proves to be legimate I will post same on my tree. But I will as you mentioned ” which will be a flag later to follow up later” . Appreciate the feedback. Unfortunately, if we “allow” it, ‘Ancestry Family Trees’ is exactly what Ancestry will put in as a source when we accept a hint from one of the members’ trees. How can we get the system to include at least the name of the member tree and a pointer to the person involved? Edit the citation to include a URL of the profile of that person? I don’t accept hints from family trees. I’ll look at the tree and see if there is anything that I find promising. If there is something that I want to add (like a death date), I’ll take a look at what source they’re using. Then I take a look at that source. If I think it’s correct, I’ll add that as a source. When someone else’s tree has clues, I’ll make a note of it for further investigation, but I don’t “accept” the tree as a hint. Great article! This cannot be emphasized too much! Another reason to cite your sources is so you (or someone who looks at your research) can go directly to the source where you originally found the information. I also think this gives us peace of mind, knowing that our work is based on legitimate facts and not on someone else’s family tree that doesn’t have any sources. In view of the ephemeral nature of online databases I also quote the original document and repository with ref nos and dates if I can. We have all seen datasets moved to other websites haven’t we? I notice that Family Search has a way for you to cite them or, that is, to cite the source. It even says: “Citing This Source” and then give the information you should use. Very helpful! Great post! There are so many posts articles websites etc out there about how to do a “correct” or “proper” source/citation and honestly it gets so complex and particular I understand that sometimes it seems just easier to write Ancestry or Family Search. For me I have decided not to worry about the “correct” way to do it as long as enough information is there so I or anyone else can easily find the original information again. Thanks, love your posts! There comes a time in everyone’s research when they find records that don’t agree with each other. That’s when you need to evaluate each source for accuracy (who was the informant, is there a reason to lie, was something written down wrong, is there something better I can use), work through the conflict and try to determine what is correct. I have never been able to figure out how to fill out the source citation thing on Ancestry or anywhere else, for that matter. Reading the blanks, some of the items seem redundant. Thank you! This has bothered me for the longest time. So often I will see Ancestry listed over and over as the only source or another person’s family tree as a source. I hope many people read your information and take it to heart. It is true that sometimes finding sources is difficult, especially when you are working on an ancestor quite far back in time. In my opinion I believe it is better to either leave it unsourced or maybe attach a note to the individual explaining that it is speculative…why you believe it to be credible but because you have not yet found sources it is speculative. I, like you, cannot emphasize enough that trees are not a source. As an example I have found where someone has quite a lot of information on my grandfather on their tree BUT they have an alternate name for him. Their source? World Family Trees. I treat Ancestry & Family Search as repositories & their databases as the source. It also helps to document if it’s an actual image or transcription. Exactly. It’s the database that’s the source. We still need to note the website so we know whose database it is, but the database info needs to be included. As a student, teacher of history, and a geneaologist, I have written papers and genealogical databases in which I needed to cite sources. There is a difference between a primary and secondary source. A primary source is the actual document, photograph, drawing, written work by the author, by the person filling in forms, taking the picture, artist, author. A secondary source connects or links to a primary source. The genealogical sites are secondary sources. 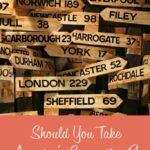 If you are collecting evidence, those sites are good to start with, but you need to spend time in the field collecting your own genealogical evidence. Assistance with citing your sources, both secondary and primary, can be found in the APA manual. 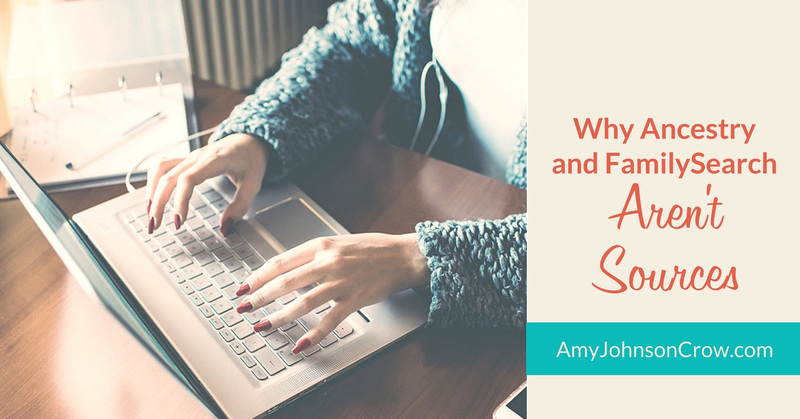 We definitely need to spend time “in the field,” but I wouldn’t be too quick to discount what we can find on sites like Ancestry, FamilySearch, and others. The databases, indices, and family trees are derivatives (or “secondary,” to use your definition). Some might quibble, but I would say that a digital image on these sites is an acceptable substitute in most cases. Pardon my ignorance, but what is the APA manual? The American Psychological Association style guide. It’s used by many of the sciences. Christine said that “genealogical sites are secondary sources”, but in fact they are repositories which may contain primary (original) sources, such as scanned images of original handwritten documents; secondary (derivative) sources, including transcriptions, articles and books which are based on primary/original sources; and tertiary sources, such as submitted family trees, which may be based on some combination of primary and secondary sources and/or a vivid imagination. While it’s probably a good practice to include the name and URL of the repository in a citation (as well as the date it was accessed), I’m not convinced it’s essential since: a) the source is often available in more than one repository, and will usually have its own unique reference which is independent of the website you happened to find it on; and b) websites (like any other repository) may close down, lose access to a particular source, or at the very least change the URL pointing to a given record. For me, the purpose of a citation is to provide information that will allow a reader to unambiguously locate the same information that the author looked at when composing their work – nothing more and nothing less. Thank you so much. Your article brings focus on part of what I call the “Ancestry virus”. This is where people accept as “facts” data that has no actual verifiable source, other than “Ancestry family tree” and then pass it on .Often I find much of the information is flat out erroneous.I now spend half of the time on my tree sending people corrections along with copies of actual documents or links / detailed locations for actual verifyable records. The only thing worse than having no information is having the wrong information. Great post, Amy. I will be including a link to it in my next genealogy newsletter for my library patrons. Genealogy citation is so important, but also so confusing for many people (including me, and I have a Master’s in History and a Library and Info Tech diploma.) I have never thought of Ancestry or any of the other sites as the source, but the location for finding original and/or derivative sources. Thank you for the information! Thank you for the effort you make to help us! Often, when finding a resource, the scanned page number (ex., 18/305), is different from the book page number, or a census page number. How can we clearly cite the “source” appropriately, so we can best find it again, or so others can find it. (I use Ancestry documents often). Your analogy of website is like a library or like a bookcase is spot on. I too agree that the citation should focus on the elements, i.e. Author, title, date, etc. and worry abt the formatting later. Thank goodness you made this important point online where everyone can read it! There is a great deal of confusion about the sources you mention and how to cite them. Great subject & info. I will not accept Ancestry trees now as a lot of times they are bogus clues with no source. I have started citing the actual DB Anceztry spits out i.e. Marriage Index 1850-1900., Is this adequate as a source when it’s on Ancestry. This info does help me to see where I found my source & for instance with this source I must take it with a pinch of salt as it does not prove a,marriage. Is this sufficient or should I get even more specific. I have some early “citations” where I listed only the film number from the LDS library and a page number. I don’t see a way to trace backwards on the Familysearch.org catalog. Do you know of a way to do this?